For the most part, the days of publishing content on social media and getting a majority of your followers to see it are gone. The move towards social media algorithms has caused many brands to see significant drops in organic reach. From Facebook and Instagram feeds to Twitter’s timeline, getting your content seen without paying for ads has become a real challenge. In this article, we’re going to do a deep dive into the Twitter algorithm. In 2015, Twitter announced that the reverse chronological timeline was going to be revamped. And as you can expect, marketers scrambled to understand what the change would mean for their reach and engagement. Today, many brands are still struggling to get their Tweets seen. If you’re still in the dark, this guide will give you a better understanding of how the Twitter algorithm works, plus 11 ways your brand can boost organic engagement. Why Does Twitter Use an Algorithmic Timeline? While the Twitter algorithm has drawn some criticism, the reality is it was probably an inevitable move when you consider how quickly things move on the network. Within a matter of minutes, your timeline can get flooded with hundreds new Tweets from all the accounts you follow. You more than likely care about some of those Tweets more than others. Twitter’s algorithm can help bring organization to noisy feeds. In the best case scenario, users see Tweets from the accounts they actually care about. Twitter has written a fairly in-depth guide about the tech behind how the algorithm works. We highly recommend reading through that if you haven’t yet, because it shines a lot of light not only into how the algorithm works, but some of the reasoning behind why it’s set up the way it is. But for the purposes of this article, one key highlight is the fact that it works on a sort of scoring system. Twitter scores all the Tweets from people you follow in order to determine what’s going to be the most relevant or interesting to you. The Tweet itself: Recency, media cards (image or video), and total engagement (number of Retweets, likes and comments). The Tweet’s author: What type of past interactions you’ve had with them, the strength of your connection and the origin of the relationship. You: What type of Tweets you found engaging in the past, and how often or how much you use Twitter. This is absolutely crucial for social media marketers to understand. One of the biggest takeaways is that you should stop looking at engagement in terms of individual Tweets. Instead, look at the bigger picture of the relationship between your brand and your audience. Do you consistently engage with your audience? What have your past interactions been like with your followers? How was your audience built? Your answers will help you understand why your Tweets aren’t getting as much engagement, and allow you to strategize on how to work within the algorithm. We’ll give you more tips on how to boost your engagement and “outsmart” the algorithm a little later. This section is where Twitter displays the Tweets its algorithm has determined you’re most likely to care about. In other words, the Tweets that received the high relevance scores (based on Twitter’s model we mentioned earlier), ordered by time. One of the newer additions to the Twitter algorithm is the In case you missed it (ICYMI) feature. ICYMI allows you to see Tweets from accounts you frequently engage with, when you first open the app. But it won’t always show up. It depends on the number of highly relevant Tweets Twitter finds since the last time you opened the app. This modules meant to contain only a small handful of the very most relevant Tweets ordered by their relevance score, whereas the ranked timeline contains relevant Tweets ordered by time. 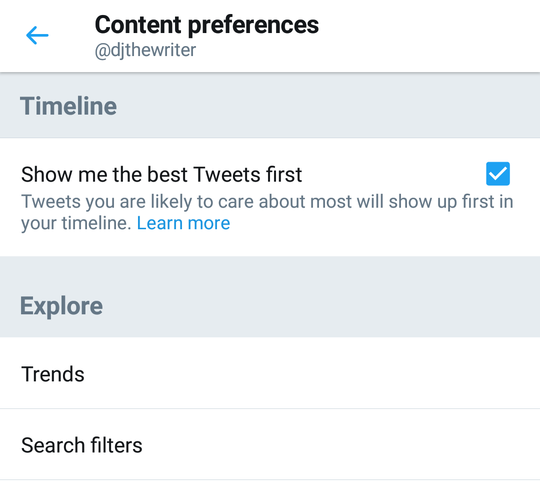 Since people can go hours without checking Twitter, ICYMI gives you the ability to see anything Twitter thinks is important that you may have missed since the last time you checked your timeline. This is crucial for brands. Since you’re competing with hundreds, if not thousands of other accounts for your audience’s attention, the ability to have your Tweets highlighted right when they open the app can give your organic engagement a nice boost. You don’t have to worry about whether or not one of your followers scrolled down far enough in their timeline to see you your Tweet. This is where your “regular” Twitter feed starts. After Twitter has surfaced the most relevant Tweets, the rest show up in reverse chronological order so you’ll see the newest Tweets from the people you follow first. While the announcement of the Twitter algorithm drew some negative feedback, one thing that’s important to note is it’s not mandatory. Twitter users have the ability to opt out and and use the original timeline by going into settings and content preferences. Just uncheck the “Show me the best Tweets first” box. That’ll get rid of the ranked Tweets so your timeline just shows all Tweets in reverse chronological order. Now that you have an idea of how the Twitter algorithm works, what can you do to get more visibility for your Tweets? Do you tend to send all your Tweets during a certain block of time in the day? If so, that could be the reason nobody’s seeing them. By now, most brands realize the value in scheduling content ahead of time to allow them to have a presence on Twitter 24/7 instead of being restricted to business hours. 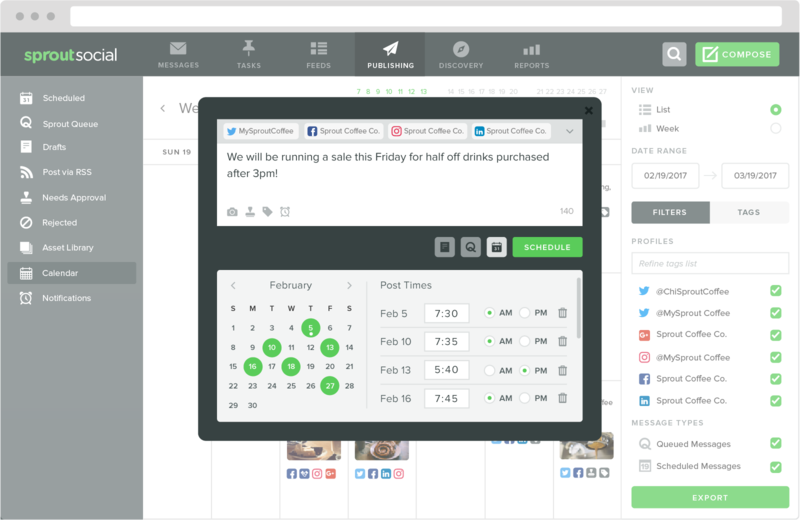 You can use a tool like Sprout Social to plan and schedule content to be shared throughout the day. Read through this article for more tips on how to schedule Tweets. Tweeting out links to your site might get you a little more traffic, but it’s probably not doing much to earn you engagement, retain existing customers or build your Twitter presence. When you look at brands that drive a lot of engagement and have built strong communities on Twitter, they tend to spend a lot of time replying to incoming Tweets and sparking conversations. The trick is to stop treating Twitter as a lead generation tool, and more as a way to connect and engage with your audience. That means responding to customer questions, resolving complaints, using Twitter Polls and asking questions. In other words, start talking to your customers, not at them. When it comes to social media advertising, most brands instinctively think of Facebook Ads. But Twitter’s advertising platform can also be useful, particularly if you’re struggling to gain traction organically. According to Twitter’s Q4 2017 shareholder’s report, cost per engagement for ads was down 42% year-over-year. On top of that, total ad engagements were up 75% year-over-year. So overall, brands are seeing more engagement for less money. If you’ve run Twitter ads unsuccessfully in the past, consider going back to the drawing board to explore new options. For instance, video ads have proven to be effective on Twitter. An IPG Media Lab survey found that 67% of Twitter users that saw video ads in First View didn’t find them to be intrusive. And 73% found the video ads to be informative. Of course, this is all assuming you have the budget to test your ads. Otherwise, you can stick to some of the non-paid tactics on this list. Learn more about how to run profitable Twitter ads. Speaking of videos, even organically sharing native Twitter videos can give your engagement a boost. According to Twitter’s online video playbook, videos are six times more likely to be Retweeted than photos and three more than GIFs. Even if you’re not working with a huge budget, doing something as simple as an AMA or even going live on Periscope can drive a ton of engagement without being highly produced. For instance, some of Socedo’s most engaged Tweets are simple sit-down style videos discussing recent trends in social media. No huge budget or production crew required. You know the old saying, “if at first you don’t succeed, try again”? Well, we say, if at first you do succeed, keep doing it until it stops working. Did you send a Tweet that attracted a ton of comments and likes? Great! But don’t just bask in the glory of that one single Tweet. Why not share it again later? As we mentioned earlier, Twitter moves extremely fast. So even if a Tweet gained traction and earned a lot of engagement, there’s a strong chance a big portion of your followers didn’t see it. Sharing that Tweet again will give you the opportunity to reach some of those followers who missed it the first time around. 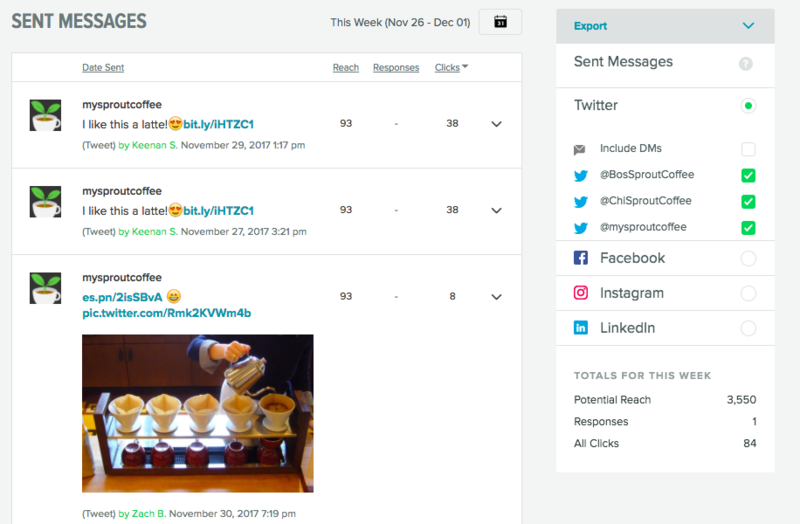 Start by using Sprout’s Sent Messages report to see which Tweets got the most engagement. Once you’ve identified those Tweets, craft a similar Tweet and schedule it again, at a different time and day than the original. It’s that simple. When you send a Tweet and a brand replies to it, do you just read it move on? Or do you like the Tweet and reply? Most people go for the latter. Unfortunately, so many brands ignore their mentions and miss out on a lot of engagement opportunities as a result. 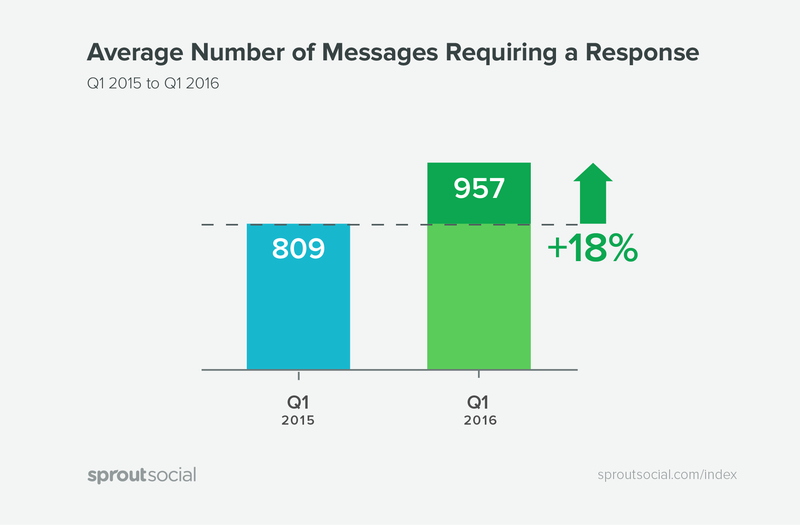 According to our data, even though the average number of messages sent to brands that require a response has increased, the average response rate has been stuck at around 11% since 2015. Your brand has to be more responsive in order to compete in Twitter’s algorithmic timeline. Whenever someone mentions your brand on Twitter, even if they’re just making a comment, take a second to reply. It doesn’t have to be a long 200 character response. Just a simple acknowledgement can go a long way and encourage people to engage back. 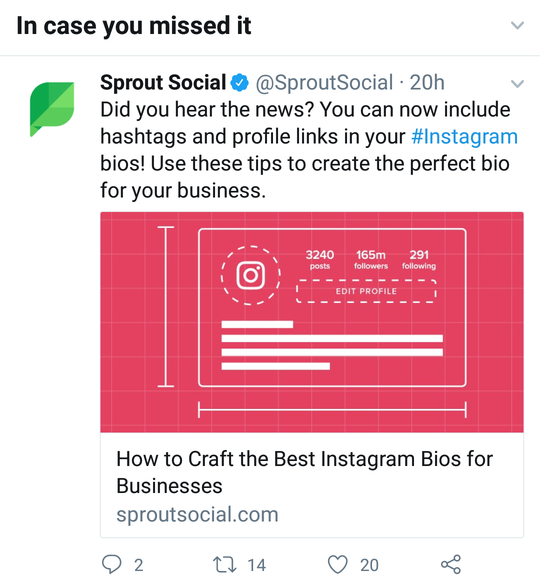 Use a social media monitoring platform like Sprout to make sure you’re catching every mention of your brand, even when you aren’t tagged. Learn more about social media monitoring. Twitter is still one of the top platforms people rely on to get insights and information on trending and timely topics. Whether it’s pop culture, politics or current events, people go to Twitter to find out what’s going on in the moment. A good “hack” to feed the Twitter algorithm and satisfy your audience, is to stay on top of current events and tastefully work them into your Tweets. For instance, the Times Up and Me Too movements are very relevant to Girl Scouts, as their goal is to empower girls around the world. They were able to cover the topic in a way that’s educational and adds to the discussion. Just keep in mind that there’s a fine line between being current and completely turning off your followers. 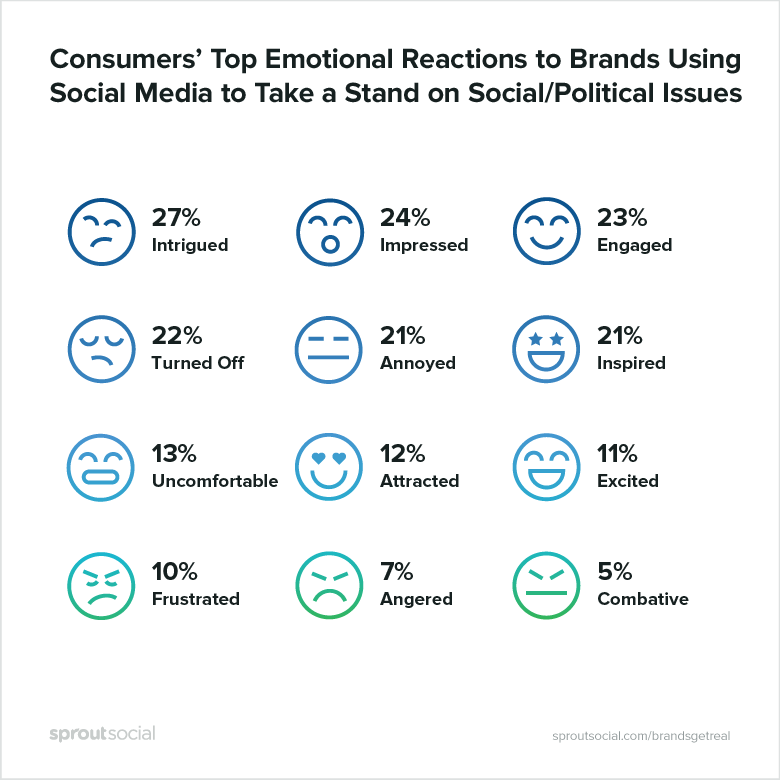 Our #BrandsGetReal survey looked into how consumers feel about brands speaking on political and social issues, and found that 21% of people are turned off by it. You don’t necessarily have to “take a stand” to Tweet about current events or trending topics. You can follow in the footsteps of brands like e-sports organization Rouge, and Tweet about less controversial topics that are still timely. Employee advocacy is becoming increasingly popular for brands looking for ways to engage their employees. The idea of empowering everyone within an organization to get active and really feel a part of your brand not only improved morale, but it can also help your Twitter marketing efforts as well. As a brand, you only have so many people you can reach. But you can significantly amplify that by getting employees to Tweet about your brand and share content as well. Plus, content coming from your employees might be more well received than the Tweets from your company handle. 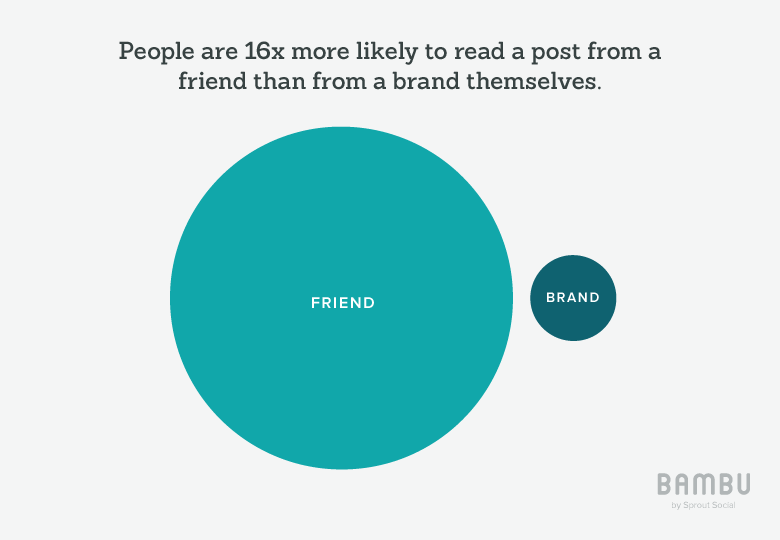 Data shows that people are 16 times more likely to read a post from a friend about a brand than from the brand itself. So how can you get employees to Tweet about your brand? You need to make it easy. Just sending a company-wide email asking everyone to share your latest blog post isn’t going to cut it. That’s why we created Bambu, an easy to use employee advocacy platform. 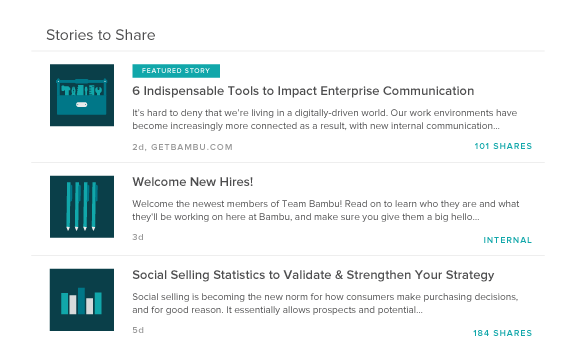 With Bambu, you can curate articles, company news and other content for your entire team to share. You can even suggest copy to use for the Tweet so all your employees have to do is personalize it if they want, then choose when they want to Tweet. You can request a demo here, and see Bambu in action and see how it can help you amplify your content on Twitter. Ultimately, the Twitter algorithm is made to surface Tweets from accounts that people are most likely to engage with. With that in mind, it makes a lot of sense to focus on driving more engagement. One thing that motivates people to engage with any type of content is to evoke some type of emotional response. Whether a Tweet makes them happy, curious or even slightly upset, they’ll be more likely to engage than if the Tweet didn’t make them feel anything at all. So how do you draw out those emotions in 280 characters or less? Think of the times you’ve seen any of these words in a headline. It probably made you stop for at least a split second. And on Twitter when people are scrolling through their feeds, all you need is to get their eyes to stop and be intrigued long enough to take a look. In the beginning of this guide, we mentioned three of the key factors Twitter looks at when scoring Tweets for it’s algorithm. One of which was the origin of the relationship between your brand and followers. Back in the early days of Twitter marketing, there was a lot of focus around getting as many followers as possible. Follower count was a popular KPI, and still is for some brands. As a result, brands tried any and everything to get more followers and sometimes lost sight of the quality of those followers. They used tactics like “follow for follow”, contests giving away irrelevant prizes, buying shoutouts and in some situations, paying for fake followers. The end result is brands with hundreds of thousands of followers but zero engagement. Instead of trying to get as many Twitter followers as you can as quickly as possible, focus on building an actual community. Sure you’ll have to put more effort into it and your growth will be slower. But the people that end up following you will engage with you much more consistently, which is what Twitter’s algorithm wants to see. This las tip is a bit forward-thinking. Twitter’s algorithm is built on deep learning. And they shared that a part of deep learning they’re looking into integrating more heavily is natural language processing (NLP). We’ll spare you the details, but essentially, NLP allows computers to understand human language for things like sentiment, context and semantics. For Twitter, that could mean the ability for the algorithm to better understand brand affinity and sentiment of Tweets. If the algorithm can determine that most of the Tweets from a follower to or about you are positive, it’s an indicator that they want to hear more from you—resulting in higher rankings for your Tweets. 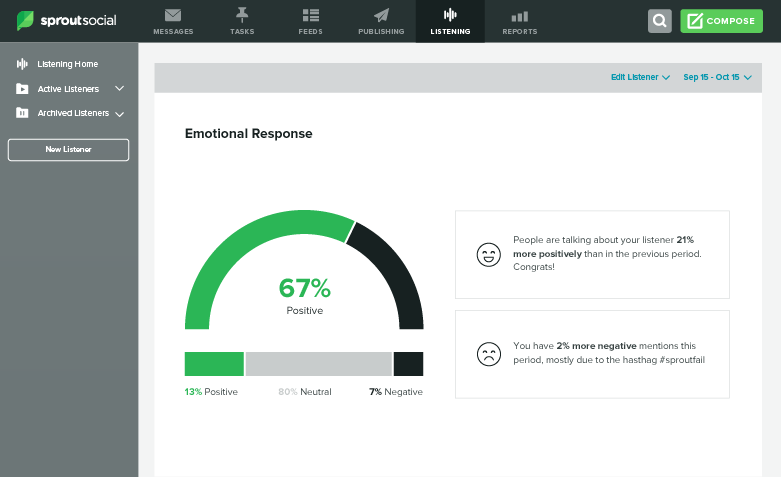 While we’re still in the early stages NLP for social media, Sprout actually has some built in sentiment analysis that allows brands to get an idea of the overall emotional response people have towards your brand or a particular campaign. Combine that data with the listening features of Simply Measured, and you can start to get full picture of the sentiment around your brand on Twitter. 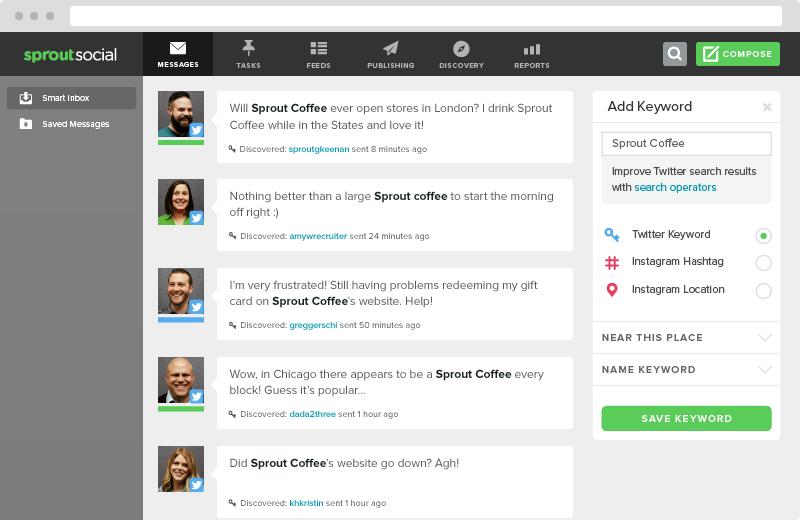 Request a demo below learn more about Sprout’s social media listening and sentiment analysis capabilities. Understanding current sentiment around your brand is one thing, but the other piece of the puzzle is maintaining a positive reputation. You can do that through being responsive, hosting giveaways, highlighting your followers and being as helpful as possible. Even providing great service off of Twitter can motivate customers to engage with your brand. Get more tips on social customer service and reputation management. The Twitter algorithm is always evolving to be more accurate and helpful. As a marketer, it’s important to try to understand how the algorithm works. But the most crucial thing to keep in mind is that you strive to get the most engagement possible and build a community. Use the tips in this article and experiment with new ways to get a head of the Twitter algorithm.